As you may remember, it was just under two months ago when I first started with a rash, which a few days later the doctors diagnosed as Graft Versus Host Disease (GVHD) of the skin, and I was started on high-dose steroids (Prednisolone) to treat it. Shortly after starting the treatment, I had a skin biopsy to confirm the diagnosis, but it actually failed to do so. However, the doctors are just assuming that the slight delay in performing the skin biopsy gave the treatment sufficient time to remove the evidence. Note: The idea is that the high-dose steroids suppress the immune system, and in doing so stop it from attacking the skin, which consequently allows the skin to heal. Over a few week period, the steroid dose is then gradually reduced and eventually stopped altogether; It needs to be a gradual process in order to prevent withdrawal symptoms, and to enable the monitoring for signs of the skin GVHD reappearing. At the time of my last blog post, which was just under a month ago, my steroid dose had that very day been reduced to 20mg/day (a third of what it was originally), with the intention of five days later reducing it to 10mg/day, and five days after that stopping it altogether. 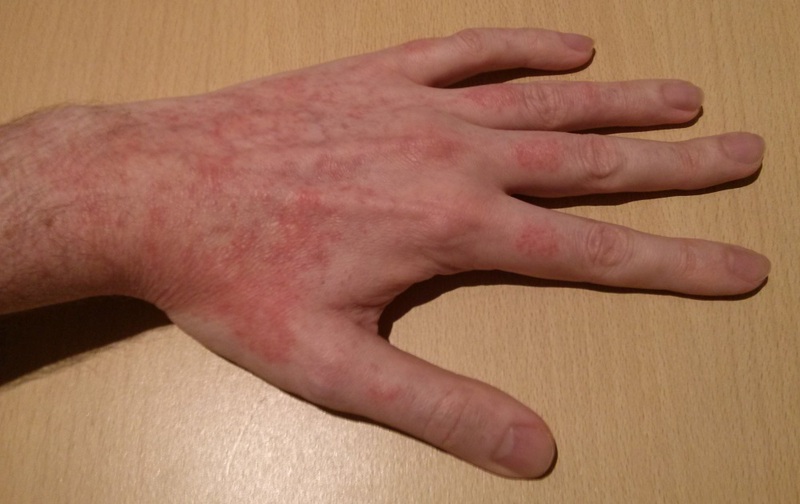 However, towards the very end of being on 20mg/day, the rash was just starting to appear again, and after a few days on 10mg/day it had become more noticeable (especially after a hot shower). Hence, on the 21st of June (day +141), I spoke to one of the doctors about the rash, and it was suggested that I went back on 20mg/day until my next appointment on the 1st of July (day +151) when it would be reviewed, but that I should get in touch beforehand if I had any further concerns. After being on 20mg/day for a few days, the rash had pretty much cleared-up, hence when I went to my next appointment the doctor decided to try reducing my steroids to 10mg/day going forward. However, after four days on 10mg/day, the rash was more noticeable, albeit still fairly mild, so I spoke to one of the nurses, who checked with a doctor, and it was decided that I should carry-on with 10mg/day for another four days until my next appointment on the 9th of July (day +159), as they needed to see the rash this time before deciding what to do next; Up until that point, the doctors had only been going on my description (over the phone) of the rash, i.e. they had not seen the reappearance themselves, hence it was difficult for them to judge its severity. 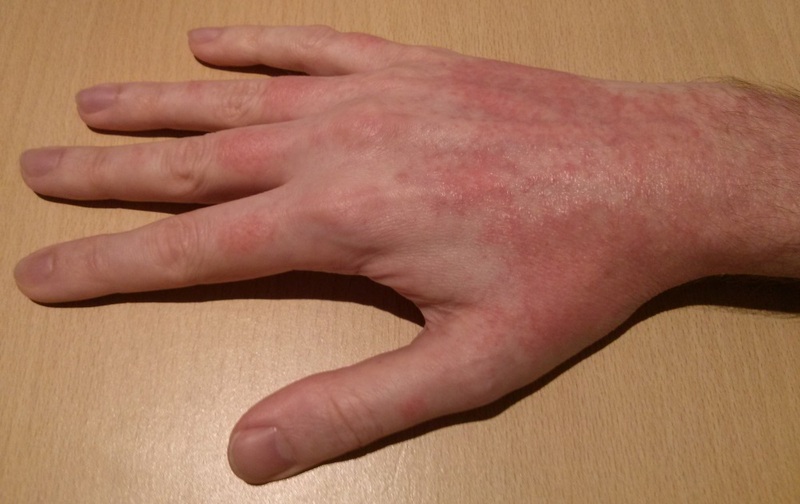 By the time that I went to my next appointment, the rash was quite clearly visible on most of my body; My skin was a combination of red, tight, dry and itchy. After a quick discussion/examination of the rash by one of the doctors, another doctor with more experience with GVHD was called to come and see me. The other doctor had a look at the rash on my hands, arms, stomach, chest, back and legs, and given that this was the second time that the rash had reappeared after reducing the steroid dose decided that the best course of action was to: increase my steroid dose to 30mg/day; start me back on Ciclosporin (the immune suppressant that I was prescribed for a few months during/after my Allogeneic Stem Cell Transplant) at 75mg twice/day; perform another skin biopsy; and refer me for a treatment called Extracorporeal Photopheresis (ECP). I'll explain much more about ECP in my next blog post, but it will consist of a number of treatments over several months, each taking place at Rotherham General Hospital. For your viewing pleasure, I did take a couple of photos of the rash on the back of my hands - not of me flashing my underwear, you'll be glad to hear! It was late evening by that point though, and the 30mg dose of steroids had already calmed the rash down a bit, so they don't really show it at its worst; However, if you view the photos full size (by simply clicking on them) you do get a better idea of what the rash was like over most of my body. I would have probably gone to the hospital a day or so earlier about it, if it wasn't for already having an appointment arranged; The hospital being a fair distance away means that I try (perhaps too much) to minimise the number of trips. The skin biopsy took place the same day as the appointment, as the doctor wanted to spare me the hassle of having to make another trip back and forth to the hospital; It was essentially the same process as last time, only the sample was taken from my back, rather than my arm, as that was the spot that looked the worst, so would likely provide the best sample. Also, just like with the last time, I needed to have a platelets transfusion, as my blood test results showed that my platelet count was 42x109/L, i.e. less than a third of the lower-end of the normal range, and they should really be above 50x109/L when having a skin biopsy, in order to minimise the risk of bleeding. Note: It is perhaps not too surprising that my appointment turned-out to be yet another long day at the hospital; I spent about six hours in there, not including the hour where I escaped for lunch, nor the two or so hours it took to drive there and back. The time in hospital consisted of: doctor consultations; blood tests and line flush; skin biopsy; platelets transfusion; collecting my prescription; and waiting for it all to happen! Whilst I wait for the latest skin biopsy results, and the ECP referral to be processed, I need to be monitored more closely again, due to starting back on Ciclosporin, hence I will be seen at least once a week for the next few weeks, with the hope of having the initial visit to Rotherham General Hospital towards the end of that period, where I'll get the opportunity to discuss the treatment in more detail, and the team there will decide whether I'm a suitable candidate for ECP, based on blood tests etc and confirmation of available funding. The skin biopsy is really just a formality, which is intended to ease the ECP referral process, i.e. given that I'm at risk of GVHD, and the rash looked and responded to treatment like GVHD, then there isn't really any doubt that it's GVHD. If you have been following my blog and I've left you wondering, despite still suffering from the two viral infections, on the 27th of June (day +145), I did actually go to what had most likely become the most rearranged dental check-up ever, as I didn't dare to rearrange it again, and I just wanted to get it out of the way. As expected, it turned-out to be a non-event, as everything was fine; The dentist once again said that I have a "beautifully clean mouth" and "I wish I could say that about all of my patients".